Whether you practice yoga from home or in a class, it’s hard to know exactly what your limits are until an injury occurs. And unfortunately, yoga injuries are more common than you may realize. According to this article from NBC News, in 2006 “nearly 4,500 people ended up in the emergency room with yoga-related injuries”. And those injuries are not to be taken lightly! They can range from bulging disks to hamstring tears – but it doesn’t have to be that way. With these 10 simple precautions, you can develop a healthy practice that you can carry out well into old age. Of course, the number one thing you should always do while practicing yoga is breathing. If your mind and body are relaxed, you will be much more aware and present in your body. This will help you get in touch with the sensations you’re feeling and back off if a pose feels too intense. Plus, when you take the time for a deep breath in your yoga practice, a whole positive chain of events is set off in your body. Just as described in this article by Yoga Journal titled The Science of Breath in Yoga, you can change the hormones present in your body by working with your breath. In the article, Sat Bir Singh Khalsa, PhD claims “[there are] a number of really good studies that [show] actively changing the breath rate can actually change autonomic function and mood state.” Basically, this means that if you are panting and breathing rapidly, your heart rate will increase and your body will feel more stress. But if you slow down and focus on your exhale your body will calm down and you will feel more present. Every yogi has busy days, but if your goal is to practice every single day, make sure you’re allowing enough time to practice safely. For example, let’s say you only have ten minutes to practice. Instead of going right into a headstand or full wheel pose, you should give your body a chance to warm up. Going into poses when your body is not properly warmed up is a recipe for injury. If you don’t have a lot of time, stick to poses that aren’t as strenuous. One great option for busy days is Sun Salutations – these get your blood moving, your body warm, and stretch several parts of your body in a few moves. As suggested by professional yoga teacher Esther Ekhart in her FAQ For Beginners, try to set aside a little over an hour for asana a few times a week. An hour-long session will allow you to target specific areas of your body and prime you for more advanced poses. There are a lot of ways to interpret that, but think of it this way – you shouldn’t hurt others and you shouldn’t hurt yourself. This applies to overstretching. In fact, there are many injuries that are caused by overstretching in yoga – including hamstring tears that can slowly develop over years of practice. According to this article by Yoga International, hamstring tears are the most common yoga injury and they come from consistently overstretching. So slow down, breath, and dial it back a little bit – you don’t have to go to the leading edge of the stretch every time. The benefits can be felt even stronger if you aren’t straining. The ultimate way to take control of your yoga practice and avoid injury is to take a 200-Hour Yoga Teacher Training. As part of the training, you will learn tons of useful anatomy, the art of sequencing, and you will get hands on advice for how to get in and out of a pose safely. The immersive process of a yoga teacher training helps you learn what your body needs from yoga and allows you to create custom sequences for yourself. And if you can’t afford a full on training, consider signing up for a few weekend immersions at your local studio. When you’re in a class full of 30 or more students, it’s almost impossible for a yoga teacher to give you quality one-on-one help. In fact, only a highly skilled teacher might be able to adjust everyone in the room at least once during a standard class – maybe even less if it is a fast-paced vinyasa class. That’s why it’s a great idea to spend the money on a few private lessons. This will allow the teacher to look at your body really closely and help you identify things that might be out of whack – like hyperextended elbows or lower back tension. Then, they will show you a few poses that will help you work your weakness. Private lessons can be expensive, but they can potentially save you from very serious and expensive injuries down the line. As mentioned before, warming up is an important element of injury prevention. Additionally, you may want to develop the proper sequencing for your practice. In yoga, sequencing is simply the order in which you perform the poses. The theory is that you can use poses to open and activate key parts of your body so that you have an easier time with the apex pose – which is usually an inversion or backbend. After the peak pose is complete, you can unwind with more cooling poses (like forward folds and twists) that will help you ease into savasana and meditation. If you’ve ever looked around a yoga class you know that not every person who does yoga has the same body. And no matter what your skill level is, there will be poses that feel better are safer when you use a prop. Even if you can go fully into a pose, your alignment can be a lot better with the use of a prop. Using props can also keep you from slowly straining your muscles over time and they can be helpful for warming up into a pose. There are all kinds of fun props you can take advantage of – blocks, bolsters, straps, chairs, wedges, and blankets just to name a few. If you don’t know how to use something, be sure to ask your teacher or bring it up in a private lesson. 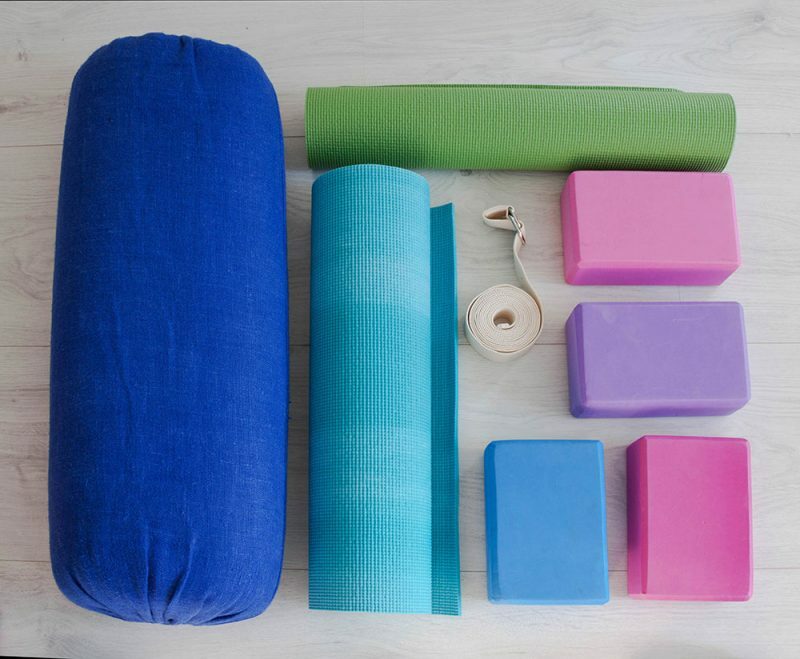 Almost every yoga teacher loves props! If you’re attending a yoga class, don’t forget that you’re partaking in a student-teacher relationship. It’s perfectly fine to ask the teacher a question if you’re unclear about the alignment or main action of a pose. Additionally, if you have known injuries, be sure to pipe up and ask how you can modify the pose to make it safe for you. How do you know you’re doing a pose incorrectly unless you can see it? Many of the known poses that can cause injury place you in a position so that it’s hard to see your body – you might be upside down in headstand or plow pose, and sometimes the best teacher is a simple mirror. If you have some knowledge of anatomy and alignment, you can put your keen eye to work and identify any weak spots in your practice that could lead to injury. If you don’t have access to a mirror, a video camera on your phone or computer works just as well. Many photos you see in any yoga publication (not just on Instagram) are unrealistic for the average person. Their goal is to provide something that is visually interesting, not necessarily safe or in proper alignment. The most important part of your practice is you – so stay in your own lane and take Instagram yoga with a grain of salt.